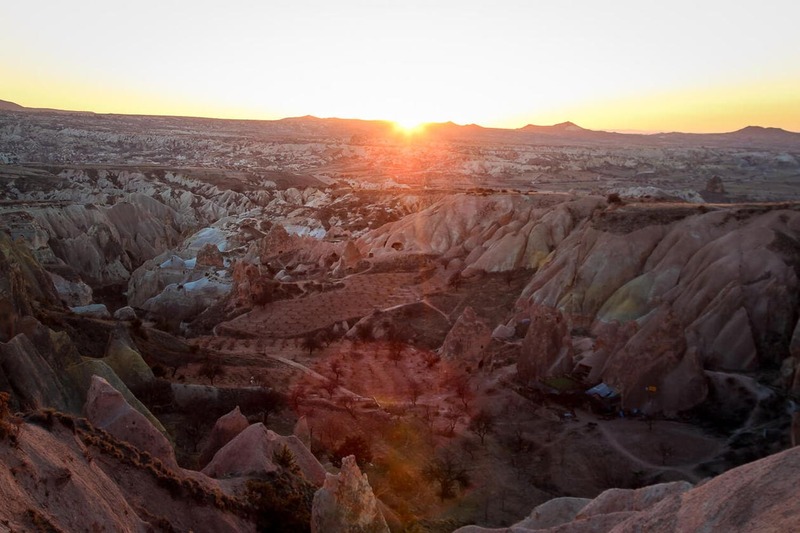 Sunsets are underrated in Cappadocia, and understandably so. 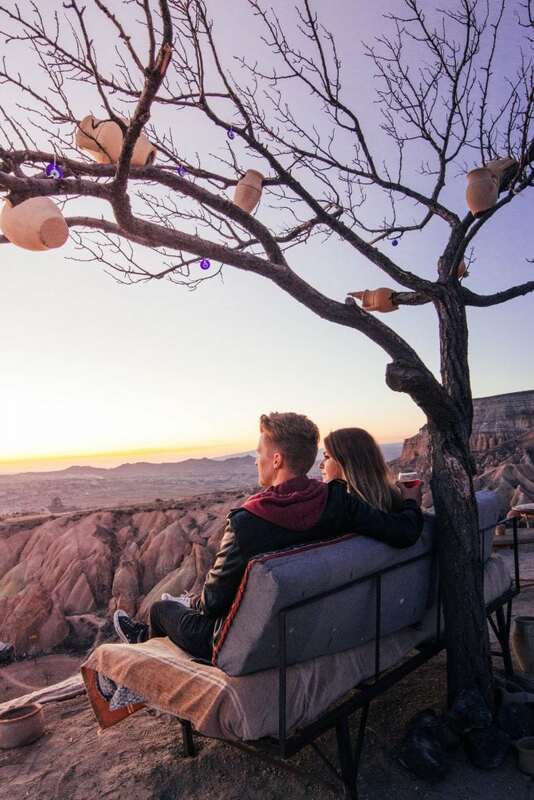 If you’re in Goreme, chances are you’ve already made special plans to experience the hot air balloons at sunrise, but don’t forget about the magic before the sun sets! 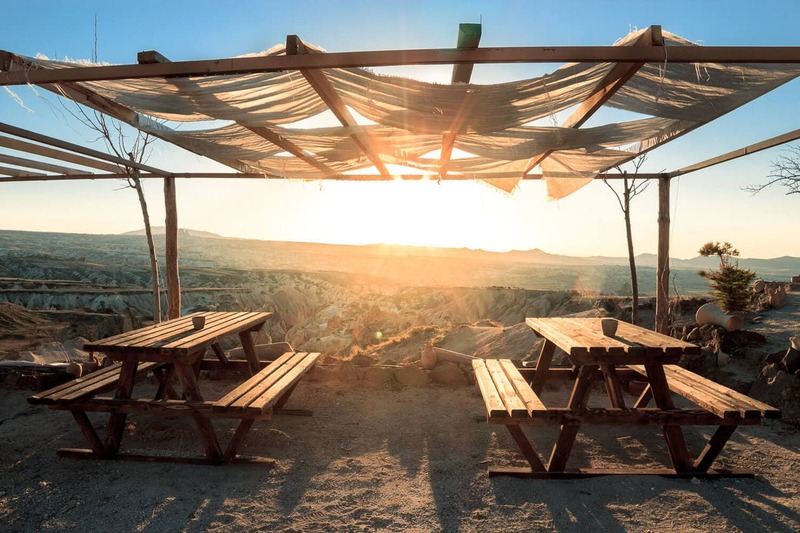 By chance, we stumbled upon the most perfect sunset cafe in the Red Valley, and we ended up returning here every night for the rest of our trip. 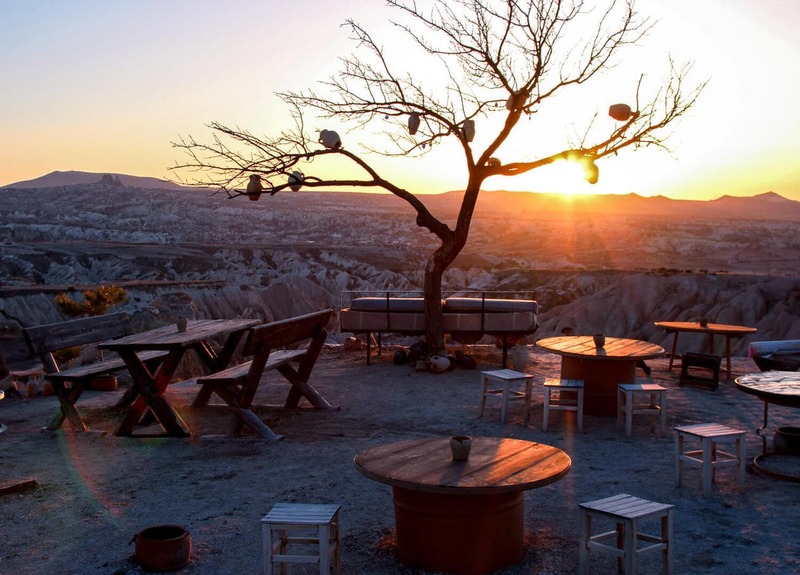 My original plan was to drive to the popular lookout, Sunset Point in Goreme. Fortunately our navigation lead us to the Red Valley instead. As we pulled up I noticed the cutest seating area lined up along the edge of a hill. 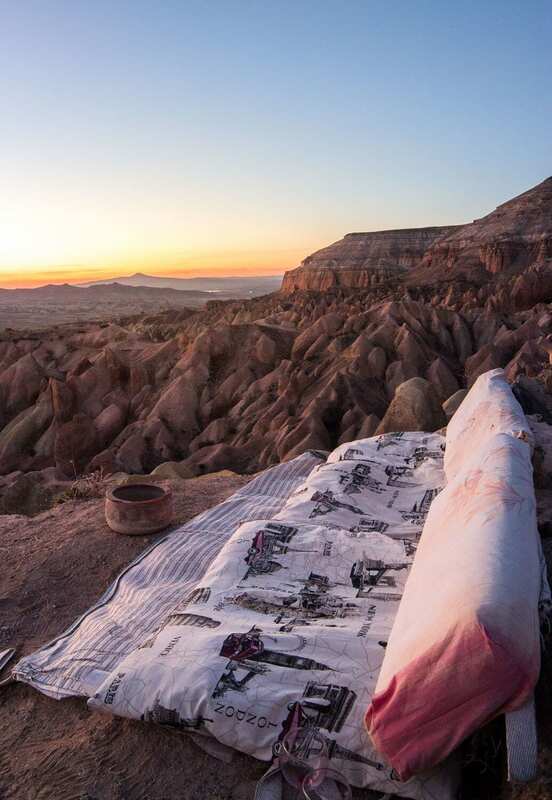 There were couches, cushions and little wooden tables overlooking a perfect view of the valley. I think I jumped out of the car while it was still moving, I was so excited. The tiny cafe serves beer and wine, fresh juice and snacks. It’s cash only and a glass of wine was 15TL ($4.22). Our first night at the Red Valley Panorama Lookout was Thursday and we had it all to ourselves until about 30 minutes before the sun set, when people slowly started trickling in. Friday night was a different story though. When we pulled up, all of the good seats were already taken and there were tons people. If you have the option, visit on a weeknight for a more private experience. I don’t know the name of the cafe, and I can’t find much information about the lookout online. It seemed to be popular among locals and Turkish tourists. 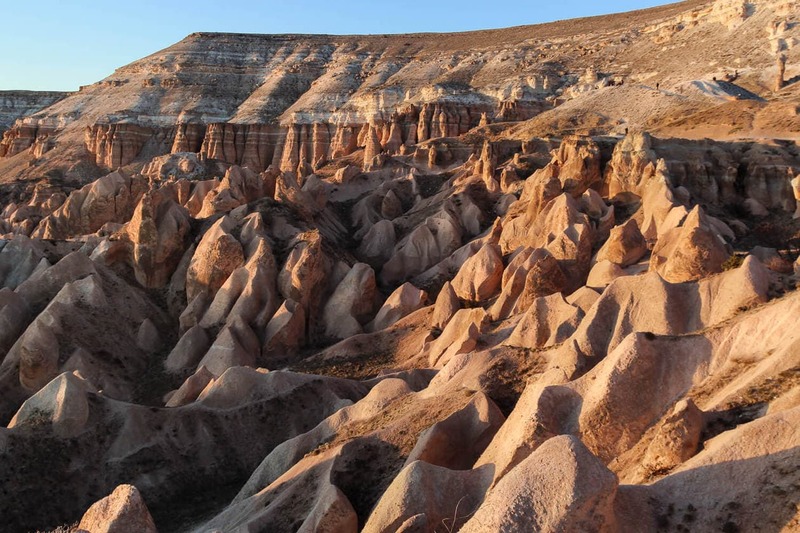 Red Valley is one of the popular hiking areas in Cappadocia. Arrive a few hours before sunset to hike through the valley. There are a few small cave churches nearby, and you can even reach Rose Valley from here. 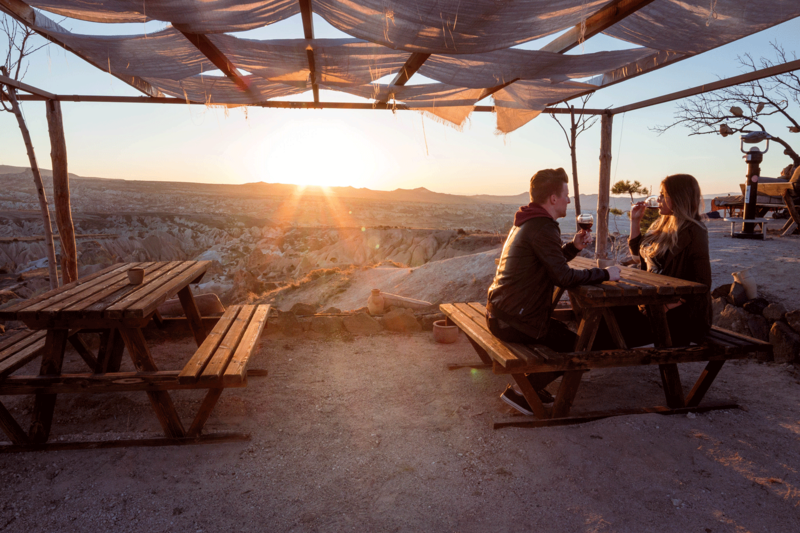 Afterwards, reward yourself with a drink while you watch the sunset. 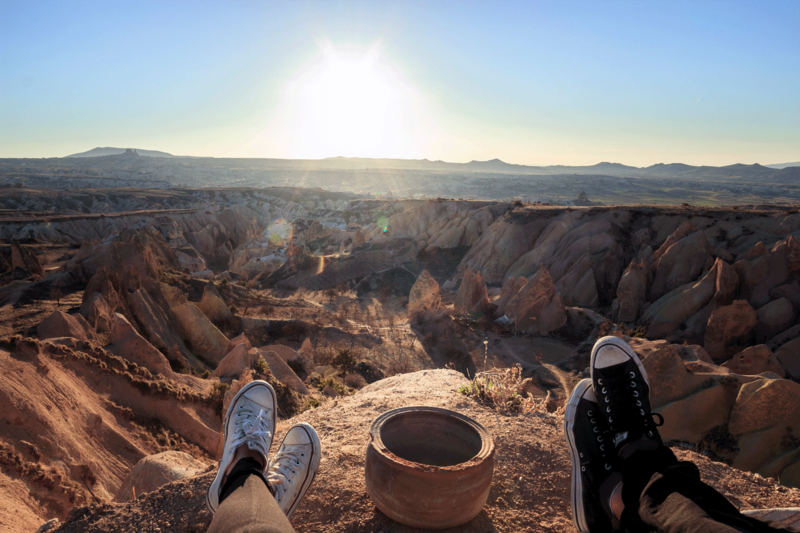 The Red Valley Panorama Lookout is a 15 minute drive out of Goreme, near Ortahisar. From Bilal Eroglu Cd, turn Right on Muze Cd for 3km (1.9 miles) You’ll pass the Goreme Open Air Museum. Turn left onto Nevesehir Urgup Yolu/D302 for 650meters (.4 miles) and then turn left on Dr. Zeliha Berksoy Blv. You’ll drive down a long empty road with a guard station in the middle. It costs a few Turkish Lira to enter the park (2TL). 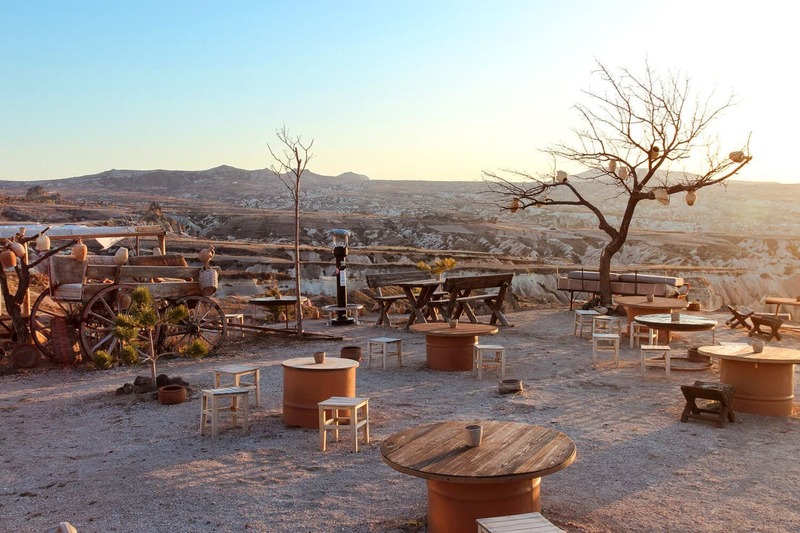 There are multiple viewing points to watch the sunset, but this cafe is the first one you’ll run into. If don’t have a car, the Red Valley is a somewhat difficult to get to. If you come to watch the sunset, keep in mind that you’ll be walking back after dark. You can take the same driving route but it’s uphill most of the way, and you’ll be walking on the side of a windy road alongside cars. You also have the option walk through the national park past Rose Valley to the Red Valley. It’s best to ask your hotel for advice on the correct route. It takes about an hour to walk there and 45 minutes to walk back. This is so cozy and adorable! I love it!! I will go here in 18 years. These pics are stunning and this place looks so peaceful, amazing! Hello! We are planning to head to Cappadocia this May and LOVE all your info. 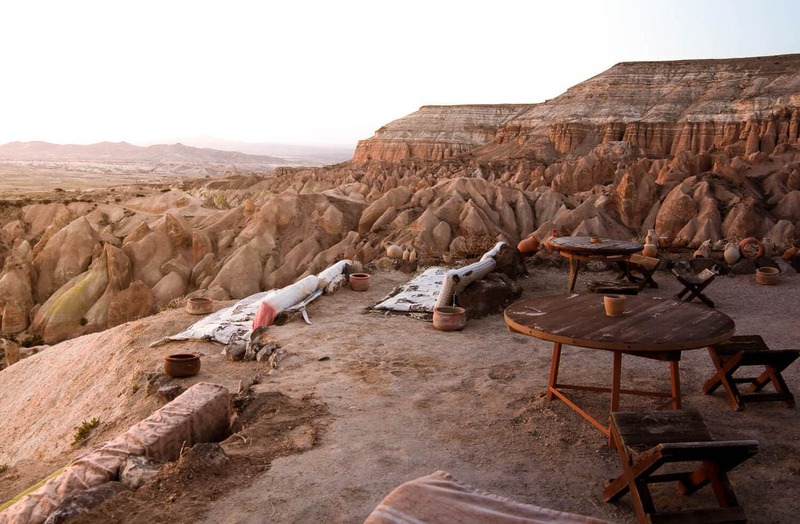 Do you have the google directions/map/coordinates of this cafe at Red Valley Panoramic Viewpoint?? I can’t seem to find it on googlemaps. Thanks so much!!! 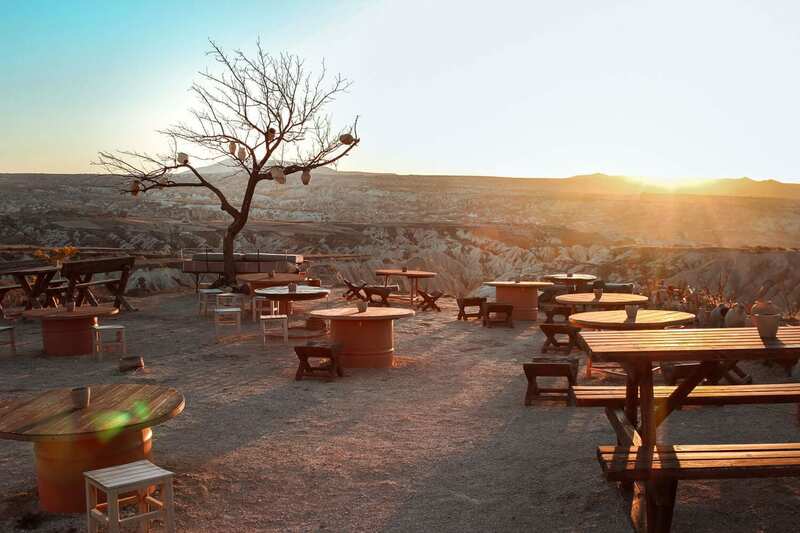 If you are driving, go toward the Cappadocia Open Air Museum, and then drive past it. When you reach the main road at the top of the hill, turn left. Drive a little ways past the Ramada Hotel. I believe it’s the first left hand turn (Red Valley). Head down a long road. There will be a guard station 1/2 way. The cafe is the first stop after that on the left. There’s not much around so it should be easy to find. We stumbled upon it by accident. Thanks so much!!! Is this the same location as the Red/Rose Valley Trailhead? 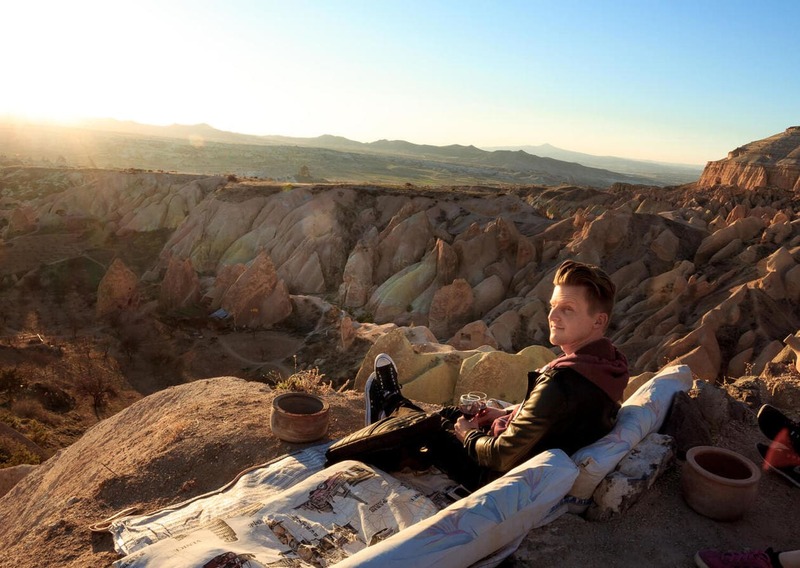 Also, do you happen to have the coordinates or directions to the Sunset Point in Goreme (btw, I just learned that this Panoramic Red Valley is also referred to Sunset Point in many maps, but didn’t understand the differences until recently!!!). I have two more questions for you if you don’t mind! 1. Did you exchange money there? 2. I hear there are two Evil Eye Trees, where are the two located? THANK YOU! 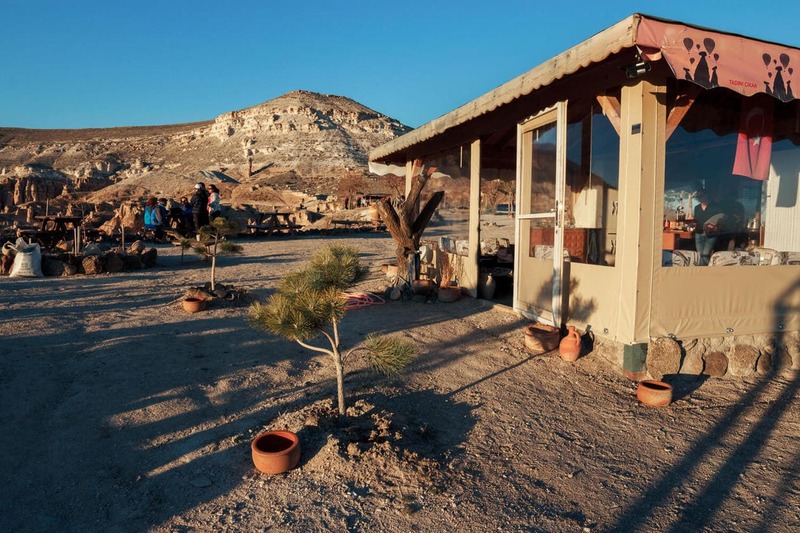 I’m not 100% sure if it’s the same location but the guard stand is there to collect entrance fees to Red Valley, so I think it is. I usually ATM (as opposed to exchanging money) because I find my bank gives me the better rates. But yes, I ATM’d there. There are evil eye trees in Pigeon Valley and Love Valley. Pigeon Valley’s tree is better/larger. I don’t know exactly where they are. Thank you! your blogs are really wonderful and helpful! ? hi lindsey. just wanna share that i think i found the name of the cafe here in your blog. it’s crazy ali panorama cafe. they even have an instagram account: crazyali_panorama_cafe and i think the pictures there are similar with yours so i think it is that place. hope it helps for your future readers. ?